With a hunk of bread or a salad, cheese can be a meal in itself. Or, carefully cut and presented, it makes a grand finish to a special dinner. And it’s an essential ingredient in a thousand delicious recipes. We always have at least 60 cheeses in our fridge. New deliveries arrive once or twice a week – more often at busy times – meaning that our selection, as well as being large, is always in perfect condition. We have a core range of about 30 cheeses that are always in stock. In addition, we buy in about 70 other cheeses on a rotating basis, so that everyone’s favourite, no matter how obscure, will make an appearance in our fridge every three or four weeks. 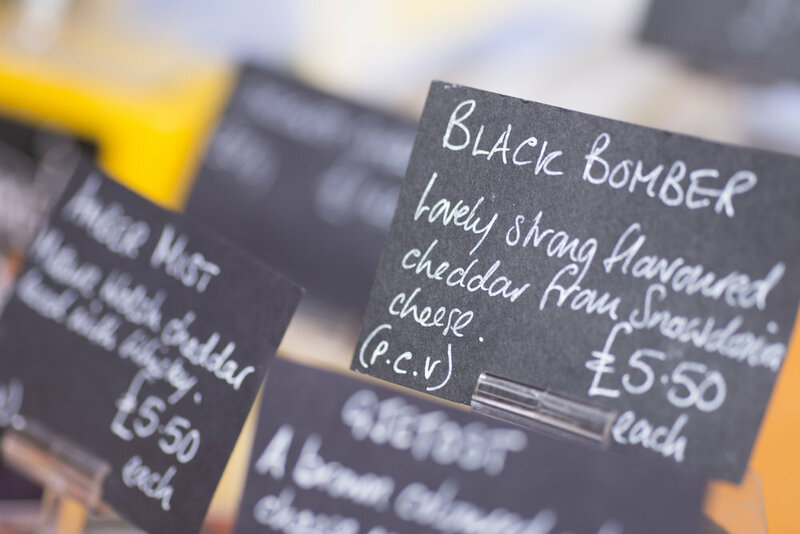 All our cheeses are labelled to make it clear which milk they are made from, whether they are pasteurised or raw, whether they’re vegetarian, and their organic status. Best of all, just ask us for more information – or for a taste! Cheese has been made in Orkney for centuries, but there are only a few commercially-available cheeses these days. All are made with cow’s milk. Grimbister is a mild, pure-white farm cheese, and a real summer favourite. Orkney Cheddar is firm, close-textured and available in a variety of maturities. We always stock Mature and Extra Mature versions, also a smoked version from Humes. Wilsons of Westray make two outstanding cheeses, using milk from their own herd of cows: Noltland Castle, a young and fresh farm cheese, and Westray Wife, a mature, washed rind cheese. We also have Orkney butter from The Island Smokery: bright yellow in colour, lightly salted. In our opinion, what Scotland does best is hard cheeses. Some of our best-loved cheddars are Isle of Mull, Loch Arthur and St Andrews. The Cambus O’ May Cheese Co. in Deeside produces several fine farmhouse-style hard cheeses, including Lochnagar, Lairig Ghru and Cambus O’May itself. The Highland Fine Cheese Company is based in Tain. They’re notable for producing a wide range of styles, from Ghru Dhu (‘black crowdie’) to Strathdon Blue to Highland Brie. All are excellent. England gives us fantastic cheddars like Wookey Hole Cave-Aged, and Godminster Organic Cheddar. Other great hard cheeses include Sparkenhoe Red Leicester and Single or Double Gloucester, as well as ‘territorials’ like Kirkham’s Lancashire, Appleby’s Cheshire and Hawes’ Wensleydale. Semi-hard favourites include Cornish Yarg and Sharpham Rustic, which is reminiscent of an old-style mature Orkney farmhouse cheese. There are several English soft cheeses now that can be considered the equals of great French soft cheeses. Tunworth, for instance, has been described as ‘The best Camembert in the world,’ by none other than Raymond Blanc. And Stinking Bishop is an outstandingly smelly washed-rind cheese to rival Epoisses. As for blues, Stilton is probably the first name that comes to mind, and every winter we sell large quantities of fine examples from Cropwell Bishop and Colston Bassett. Shropshire Blue and Yorkshire Blue are two other fine examples. From Wales we get Gorwydd Caerphilly, Perl Wen (Brie-style) and Perl Las (a mild blue) and another of our best sellers, Black Bomber, from the Snowdonia Cheese Company. Northern Ireland gives us occasional visitors Ballyblue and Ballyoak (that rare thing, a smoked Brie) whereas from the Republic we like Cashel Blue, Knockanore and Gubbeen. We’re great believers in shopping local, and in eating local produce. But we must be honest: sometimes certain parts of the world have achieved perfection in making a foodstuff that other countries can only dream of equalling. Look, we’ll just come out and say it: we think France makes the best cheese in the world. Our most popular Spanish cheese is Manchego, but other favourites include Monte Enebro, a prize-winning soft goat’s cheese, and Picos Blue, which is a crumbly, very blue, blue, wrapped in maple leaves. We always have one or two Gouda-style cheeses from the Netherlands. We prefer well-aged versions, such as Beemster XO, which has a lovely butterscotch flavour and crunchy crystals. Prima Donna is another perennial favourite. From Germany we have Montagnolo Affine, a mild, buttery blue that was Supreme Champion at the 2013 International Cheese Awards. Switzerland gives us some excellent hard mountain cheeses, including Gruyère and Etivaz. From time to time we bring home a special selection of Scandinavian cheese, but one we have week in week out is Gjetost from Gudbrandsdalen. This is one of the famous Norwegian brunosts – ‘brown cheeses’ – a dense, sweet, fudgey cheese. Italy produces a lot of good cheese, and some great cheese. Parmigiano is the ultimate grating cheese, but it’s great to nibble on too. Gorgonzola is one of the world’s finest blues; we love the Dolce version, sweet and creamy. Taleggio is an excellent and fairly pongy washed-rind cheese. We get various Pecorinos in throughout the year, including mature Nero; Rosso, its rind brushed in tomato pulp, and young and soft Fresco. Our most popular variety is Pecorino Tartufo, which is semi-hard and speckled with black flecks of truffle. Its aroma is heavenly. Sorry, but we don’t current sell cheese on a mail-order basis. Check out our blog for news on our latest arrivals, recipe ideas, and special cheese tastings.